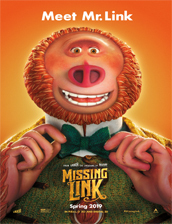 Synopsis: Missing Link follows "myths and monsters investigator, Sir Lionel Frost, who sets off on an adventure to the Pacific Northwest to prove the existence of a legendary creature—Mr. Link. Frost, who's also looking to gain acceptance by his small-minded explorer peers, is accompanied on his journey by Adelina Fortnight, a free-spirited, independent adventurer who just so happens to possess the only known map to their secret destination of trying to find Link.